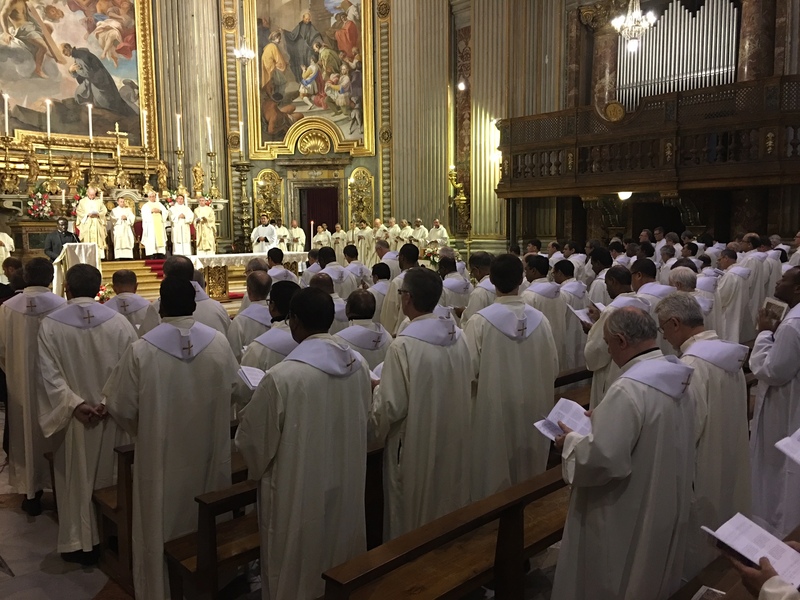 In St Ignatius Church, a parish run by the Society of Jesus in Rome, Fr General Arturo Sosa celebrated the Mass of Thanksgiving for the closure of the 36th General Congregation. The main concelebrants were Fathers Douglas Marcouiller and Antoine Kerhuel. In his introduction, the General invoked Mary, under the title of Our Lady of the Way, as is traditional in the Society, praying for her intercession of as she accompanies the “friends in the Lord” leaving for every corner of the world after their travails at the General Congregation. He also asked Mary to help all the Jesuits to be true and authentic witnesses of the message of Christ, that they might credibly reflect his face to the world. The Scripture readings for the Liturgy of the Word were chosen for the occasion. From the First Letter of Saint John (4:7-16) we heard the insistence on mutual love, a reflection of the love of God, which should motivate all our relations, not only among Jesuits, but also with those whom they serve, and to whom they are sent. The Gospel was also from St John (Ch 16). It was about the sending out of the disciples at the Ascension, “to preach the Gospel to all creatures.” The evangelist ends by underlining that this commission bore fruit: “They went everywhere, Lord working through them and confirming the Word with the signs that accompanied it.” Even though these signs described by John – facing serpents and deadly poison – may be different through changing centuries and contexts, their healing and liberating character is always relevant, and can certainly ground witness to the Gospel today. Father General’s homily is available on our website [original in italian, translation to english, spanish or french]. We invite you to look at it, to find food for your meditation and support for your apostolic involvement. After a very universal set of prayers of the faithful (in which the intentions were announced in Polish, Portuguese, Romanian, Japanese, French, Sinhalese and Arabic), the offertory procession was accompanied by a Congolese liturgical dance. This departure from a strictly Roman tradition was another way of the Jesuits emphasising the universal nature of their service, which should be always moving, evolving, according to the needs of the times and the peoples. In the same line, an Indian rite, with flowers and incense, was used at the end of the Eucharistic prayer. We invite you to pray the prayers of the faithful which you can find in the ‘prayer room’ on our website, and to add your own intentions. Access to the full homily in english here.